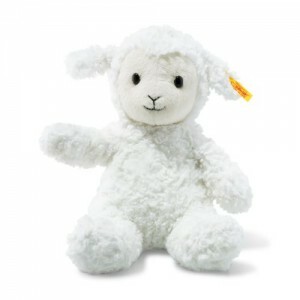 The cute, white Soft Cuddly Friends Fuzzy lamb in the 28 cm size is giving the world a silly glance, looking forward to being picked up and cuddled by your little one. She's giving you a merry invitation to play. The bean bags at her seat, hooves and soles are just asking to be touched and squeezed. Your child learns to grab and feel by playing. Your little one and your stuffed toy will become best of friends, giggling along the way.